I’m a major procrastinator, especially when it comes to working on my cars when it’s cold outside! Because of that…it’s taken me forever to get the rear end swap in my ’37 done. Ok…not necessarily forever, but a little over a month. The springs and rear end have been hanging in the car for about 3 weeks, and all I needed was to replace the driveshaft to one that was about 2 inches longer than what was in there, as well as needing to run brake lines. Since I am using drums on the back, I had to add a proportioning valve and also find a longer flex hose. Everything is back together now, but the brakes feel a little soft still, but plan on re-bleeding those tomorrow. The other cool thing that has happened is that my buddy Mickey just bought a ’47 Dodge. 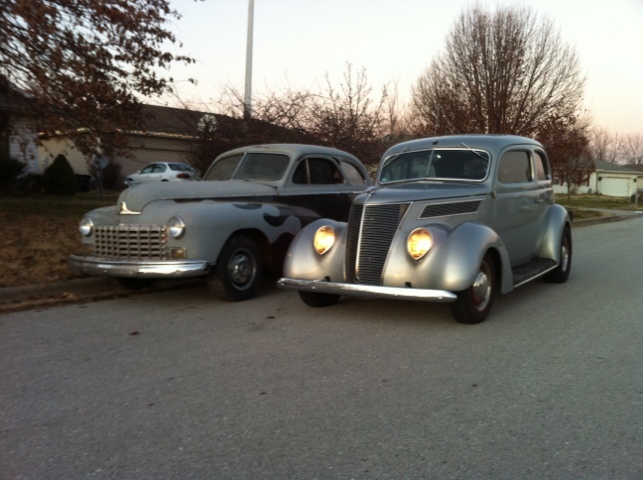 The picture is of my ’37 and his ’47, over at Mickey’s house. I am glad have the car back on the road, and also glad to have a car with heat, again!